The Fourth of July means cookouts and cookouts mean burgers. Regardless of “historical” claims linking the burger to Germany or even the Roman Empire, we here in America claim the burger as our own. In a lot of ways the burger is the perfect embodiment of the American dream—it can be anything you want it to be. So with that in mind, we give you 50 burgers for 50 states. Part burger, part sloppy joe, the story goes that it was invented in the ’50s in the town of Anniston in a state known more for its barbecue than its burgers. There’s not that much beef in Alaska, there are, however, more caribou than in any other state—probably because there are almost no caribou in any other state. Arkansas cannot say it has invented many foods. One the state can claim though is the fried pickle, created by Bernell Austin of Atkins. If your burger suffers from too many floppy dills, drop a few fried pickles on top. 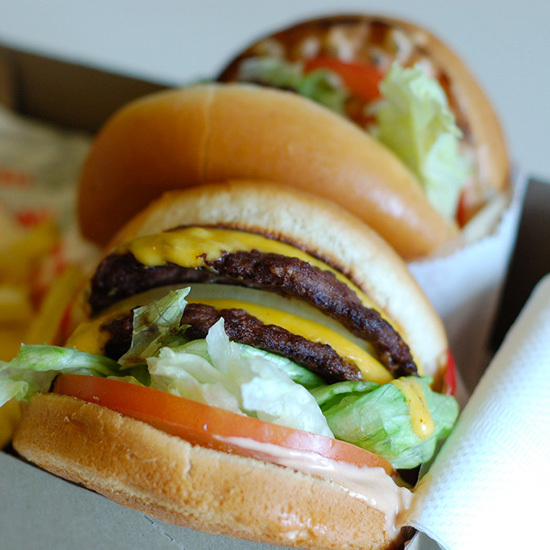 There is not much that has not already been said about In ‘N’ Out’s signature burger. If you live in a state without access to a branch of the fast food joint, we are truly sorry. Legend has it that this unfortunately named burger, smothered in red or green chili sauce and totally unmanageable without a knife and fork, originated in Pueblo back in the ‘50s. According to the Library of Congress the hamburger’s true home is Louis’ Lunch in New Haven. Louis’ burger could not be simpler: A patty with tomato, onion and cheese (no condiments) between two slices of white bread. Scrapple, for the uninitiated, is pork scraps mixed with flour and spices and then pressed into a loaf. It’s definitely not the most popular food in the world, but Delaware does make more of it than anywhere else. So they might as well start topping burgers with it. Even Delaware craft beer darlings Dogfish Head started serving a scrapple burger at their brewpub (as well as a scrapple beer, which we are happy to take a pass on). A Cuban riff on the burger—ground meat topped with ketchup and crispy shoestring potatoes. It’s an excellent all-in-one street food. Screw buns. The Luther uses a doughnut to hold its patty and while its origin is still debated, the owner of Mulligan’s Bar in Decatur claims to have invented the massive gut bomb. The one state that shows real respect for Spam, Hawaiians find ways to add it to almost anything and that includes burgers. Idaho is not really known for burgers, but Big Jud’s in Boise has staked a reputation with its two pound burgers. Probably better known for Chicago dogs or deep dish pizza, Illinois is also home to the original Steak ‘n Shake. Originally, owner Gus Belt would roll out a barrel of t-bone and sirloin steak and grind them in front of his customers to prove his burgers were, in fact, made of steak. Is it real? Sort-of-not-really. But it is still awesome. Sort of a sacueless Sloppy Joe, the Iowa specialty is not winning any beauty contests, but that hasn’t stopped people from ordering it for more than 80 years. One of America’s preeminent drunk foods has its origins in Wichita almost a century ago. Lest you doubt its importance, Time named the slider the most influential burger of all time in 2014. Kentucky purists might prefer this in it original form—a smothered, open-faced turkey and bacon sandwich. But comfort food like this demands to burgered. Look, creole cuisine is just not that burger friendly. Louisiana did, however, have its own fast food burger franchise for a while called Burger Tyme that made a super spicy burger. Maine’s classic burger is served simply with mustard, red relish and fried onions and has been for over 50 years. What is Maryland known for? Crab cakes. Even the Baltimore Orioles started topping burgers with them. Look, some places don’t have a famous burger. Some places have famous people. And we can say with certainty that Wahlburgers is the only place on this list that had a TV show made about it. Like Iowa’s Tavern Sandwich there’s no patty here, just loose meat. You’ll find them at Coney Island restaurants, named for the Coney Island style chili dogs they serve. An inside-out cheeseburger. Instead of topping it with cheese, Minnesotans stuff their burgers with it for a gooey center. A simple, deep fried burger that even has its own festival in Corinth, Mississippi. What have your burgers been missing all these years? Probably peanut butter. That was the special on the menu at the sadly closed Wheel-Inn in Sedalia. It’s legend lives on though. Sorry Iowa, Carroll Dietz of Missoula beat you to the punch with the invention of the steamed burger, much like your Tavern Sandwich, in 1920. Maybe more meat pie than burger, the Runza is at least reminiscent of a burger and has a set of Nebraska restaurants dedicated to it. A two patty burger with origins in Reno. While not as flashy as what you’ll find in Vegas, it gets the job done. Starting with a food cart in 1912 Gilley’s PM lunch is a piece of hamburger history. The burgers are simple, but sometimes simple is all you need. Tiny burgers, with a heavy dose of onions that have proliferated in the Garden State for decades. Exactly what they sounds like: Burgers loaded with spicy New Mexico green chiles. In ‘N’ Out’s foil in the East Coast/West Coast burger feud. What began as a simple hot dog cart is now a fast food burger empire. Topped with chili, coleslaw and mustard-based BBQ sauce, you can find it all over the state. Another state without a real burger history. They do have a real bison history though. They’ve even got a buffalo museum. Akron, Ohio is another city that claims it made the first burger in the 19th century, but it was in the 1920s that it developed a burger of its own. Thacker’s Restaurant served the beloved burger with mustard, onions, pickles and absolutely no ketchup for over 60 years and now the original recipe has been recreated at Sue’s Diner. Because putting onion on top of your burger is never enough, Oklahoma-style onion burgers smash them right into the patty. Sorry Oregon, you were home to the first veggie burgers in America at the Gardenhouse in Gresham. So you’re getting veggie burgers. Philadelphia already has the cheese steak so we went looking to another part of the state for a burger. Primanti’s out of Pittsburgh loves to load up their sandwiches with French fries and burgers are no exception. As in Oklahoma, the Stanley has onions pressed right into the patty. Maybe not original, but still delicious. Burgers topped with pimento cheese proliferate all over the South, but South Carolina claims the first one, likely at the Dairy Bar in Columbia. It might not be unique, but it’s got plenty of history. Since 1929 Nickburgers with onions and relish have been sold in Brookings. Somehow they have managed to keep the price ridiculously low considering the number of $14 burgers in America now. You can still get a Nickburger for just two bucks. Legend has it that the burgers at Dyers are fried in the same grease used over a century ago. Is that true? Who knows. But it makes for a heck of a story. No, you don’t usually think pastrami when you think Utah, but the Crown Burger chain started topping their burgers with the cured meat in 1978 and inspired many imitators. Have you ever tried Vermont maple syrup in your burgers? You should. Along with In ‘N’ Out and Shake Shack, Five Guys from Arlington is the other member of the elite fast food burger world. Washington hasn’t picked salmon as its official state food, but it probably should. Some West Virginians split open their staple pepperoni rolls—meat and cheese-stuffed buns—and fill them with burger patties. Because sometimes burgers can just be too healthy, butter burgers have butter everywhere. The burgers are grilled in it and the buns are soaked in it. It’s possible there are more elk than people in Wyoming.